The John Johnson Collection collects modern ephemera, which is sorted into some ninety categories. Although there are some special categories (e.g. Oxford University Societies and Private Presses), mostly this is as broad-ranging as possible with the aim of reflecting contemporary society. Occasionally, however, we create special collections to mark events of national or international significance. Last year, we gathered ephemera relating to the Royal Wedding. This year, we are collecting printed ephemera relating to the Queen’s Diamond Jubilee and to the Olympics. We would be grateful for contributions, however slight, e.g. fliers for jubilee street parties, advertisements for memorabilia, concerts, events, and all ephemera carrying the official logos of the Diamond Jubilee or the Olympics. We do not collect three-dimensional artefacts. My name is Ian Matzen. I have just begun a second semester of a distance learning program to earn a MLIS (Master of Library and Information Science) at San Jose State University situated in California. It is my pleasure to be cataloguing items from the Cinema category of the John Johnson Collection of Printed Ephemera. I have a keen interest in film and history, so this material is a fascinating window into a bygone era. The category includes magic lantern slides, lantern lecture advertisements, and magic lantern catalogues which date from the mid 1800s to the mid 1900s. I was surprised to learn of similarities between old lantern projector apparatus and the film projectors I worked with while in film school. However, most of the machinery in the catalogues ran on gas! Recently, I entered information about a leaflet announcing a new India travelogue by the famous American Lowell Thomas: Through Romantic India. Mr. Thomas notably sensationalized the exploits of T.E. Lawrence through the Arabian desert (see With Allenby in Palestine and Lawrence in Arabia, 1922). This beautifully printed leaflet promises viewers the opportunity to follow H.R.H. The Prince of Wales from Calcutta to Peshawur, making a brief stop to sit with “Hindu Holy men on their beds of sharp iron spikes”. This vicarious trip was not for the squeamish. 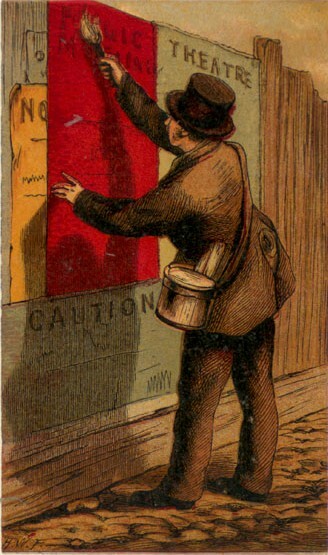 The blue ink with which the leaflet is printed gives it an air of exoticism, especially as blue ink seems to have been rarely used in advertisements during this period. On the front of the leaflet is an elegantly dressed couple gazing over a lake at a magnificent Indian city. 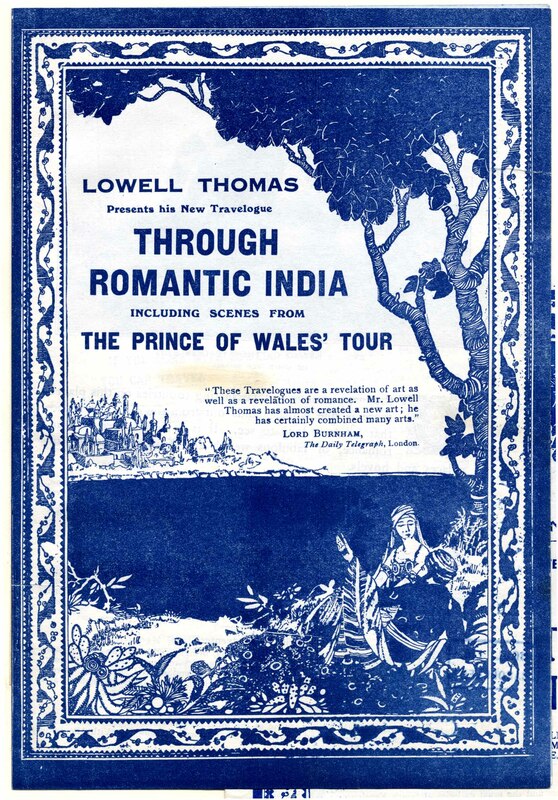 A caption reads “Lowell Thomas Presents his New Travelogue Through Romantic India”. The British audience would have found the reproduced photographs of Sadhus and a family on the last three pages dazzling. If we attended the event, we would have been treated to a 1920s event filled with a lecture by Lowell himself (talkies had yet to be popularized). According to one account the travelogue was “the best presentation of a foreign country which has ever been shewn, or which I think it will be possible for anyone to bring together”. The events, however, were not without controversy. India, at the time, was part of the British Empire and would be until shortly after the Second World War. Stationed outside the venue, Communist groups regularly protested the unequal treatment of the poor in India. At one performance, a group of students began to protest when a picture of Ghandi appeared. A Bodleian stamp on the front of the second page helped me to date the item. Given the opportunity, I would certainly have attended the event. Wouldn’t you? Welcome to the new John Johnson Collection blog! Last year the John Johnson Collection moved off-site until the New Bodleian has been refurbished as a Special Collections library (to be called the Weston Library). Until late in 2014 the Librarian of the John Johnson Collection and her twelve volunteers are in temporary accommodation. A good opportunity to make progress with projects, new and unfinished, and to blog about items of ephemera which are topical or striking. The John Johnson Collection currently has twelve excellent and committed volunteers. They are all engaged on different projects. Volunteer voice will be dedicated to their experience of working in the Collection and items which have fascinated them. 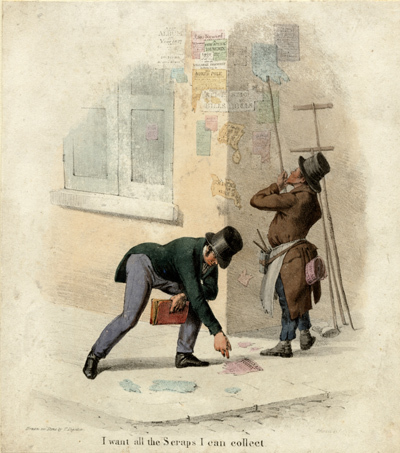 Author Posted on 25 January 2012 Categories GeneralTags volunteers1 Comment on Welcome to the new John Johnson Collection blog!